UV vs. blue light: Which is more dangerous? Gary L. Morgan, OD, focuses his blog on AMD prevention, strategies for monitoring patients with AMD, the effects of blue light on the retina and mitigating the unforeseen effects of technology on vision and overall health. He is in private practice at Eye Tech Associates in Arizona. Disclosure: Morgan is an advisory board member for Arctic Dx, MacuHealth and Signet Armorlite. We concluded the last blog with a question: Which type of light do you feel is more dangerous to your patients, UV light or visible light including blue light? Of course, answers to questions can always be up for debate. My answer to this question is blue light, and if you answered UV, over the next few paragraphs I hope to change your mind. Let’s start by discussing the damage UV light can cause the eye. Cancers of the ocular adnexa, pinguecula, pterygium and photokeratitis are all conditions known to be associated with or caused by UV light exposure. Likewise, long-term exposure to UV has been linked to cataract formation. However, all of these conditions affect the anterior segment of the eye and are generally treatable. Rarely do conditions such as these cause legal blindness. Notice a condition I left off the above the list is age-related macular degeneration. Now, you may question this, as you have likely read a report by Council X, or Association Y that claims UV light leads to AMD. I cringe a bit every time I see the “UV causes AMD” statement in print. While UV protection is important (after all, who wants a basal cell carcinoma on their eyelid? ), I feel that this may be leading to a false sense of security for doctors, opticians and patients alike in the choices of lenses dispensed. When thinking about light, we need to think in terms of wavelength. UV light encompasses wavelengths from 100 nm to 400 nm, visible light wavelength is from 400 nm to 750 nm, and infrared is from 750 nm to 1 mm. The key here is to think in terms of energy, with shorter wavelengths having higher energy and longer wavelengths having lower energy. For example, a day at the beach without sunscreen can lead to a nasty sunburn – UV has a short wavelength that is high energy. Likewise, cell phones operate at about 900 MHz (considered an electromagnetic or radio wave), which is about 330 mm. Considering 1 mm is 1 million nm, comparatively, these are low-energy wavelengths, which is why we may lose our signal when stepping into an elevator, as the wavelength is too weak to penetrate into the elevator shaft. Fortunately, the eye is actually pretty good at protecting the retina from UV light. UV light contains UV-C (100 nm to 280 nm), UV-B (280 nm to 315 nm) and UV-A (315 nm to 400 nm). The atmosphere blocks natural UV-C and most UV-B rays, with UV-A accounting for 95% of rays reaching the earth’s surface. UV light wavelengths shorter than 295 nm are blocked from entering the eye by the cornea, and those below 400 nm are blocked by the crystalline lens. A small window of UV-A centered at 320 nm can penetrate the very young human lens, so let’s remember to tell moms to put sunglasses on their kids. Now, it is possible to overwhelm the eye’s natural UV protection by doing something such as staring at a solar eclipse. However, by and large, UV light does not reach the retina. On the other hand, visible light does reach the retina. Blue light, sometimes referred to as high-energy visible (HEV) light, encompasses 400 nm to 500 nm. Numerous studies confirm that cumulative lifetime exposure to blue light causes photo-oxidation of retinal cells that leads to AMD. As you probably know, AMD is the leading cause of blindness for those older than age 55 in the U.S. As the Baby Boomers age, 10,000 of them will turn 65 each day from 2011 to 2029, and AMD will reach epidemic proportions. Although numbers vary on the number of new dry AMD cases per year, it is projected that there are more than 2 million new cases of dry AMD (all categories, including “pre-AMD”) and more than 200,000 new cases of wet AMD each year. 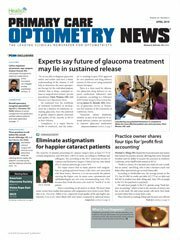 There are currently about 2,500 retinal specialists in North America. Some quick back-of-the-envelope math tells us that this will be overwhelming in the coming years. As with any epidemic, putting preventive measures in place can help stem the tide of those affected. This will certainly be the focus of future blogs. Roberts JE. Photobiology of the Human Lens. Original research article, Fordham University, Department of Natural Sciences, 2011. New York, NY. http://www.aging.ny.gov/livableny/resourcemanual/design/iv1a1.pdf. Accessed October 14, 2014.
http://www.who.int/uv/intersunprogramme/en/. Accessed October 14, 2014. Beatty S, et al. Surv Ophthalmol. 2000;45:115-134. Loane E, et al. Br J Ophthalmol. 2008;92:1163-1168. Wu J, et al. Surv Ophthalmol. 2006;51:461-481. The Foundation of the American Academy of Ophthalmology. AMD: An overview of the disease. http://www.aaofoundation.org/what/AMD/Overview.cfm. Accessed October 14, 2014.